New (and semi-depressing) blog Fed Up: School Lunch Project is written by a teacher who plans to eat her school’s hot lunch every day in 2010. I know we all know school lunch is crappy, but to see each lunch (like the one pictured above), one after the other, is downright grim. And the polar opposite of that Salisbury steak? Pljeskavicas—or “Balkan burgers”—as seen in this week’s New York Times food section. I think a trip out to Astoria is in the near future for me. I thought the mass produced Sysco lunch was bad back when I was in School, but individually shrink wrapped servings, really? Do we spend so little on education that we can’t do better than airplane food? And how much does it cost to cart away all that paper/plastic? Besides all that fiddly packaging, there’s also the small matter of the trays the food is served on. You’ll pardon my all-caps hysterics, but the NYC school system? THROWS OUT FOUR MILLION STYROFOAM TRAYS A WEEK. Doh, too late. I was going to say precisely what Tim said. 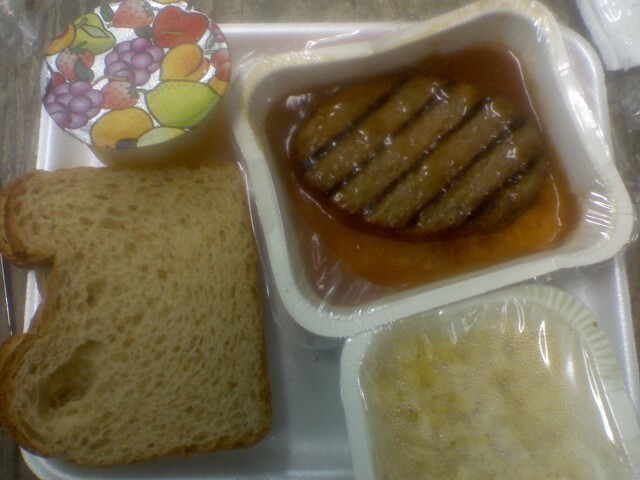 That is pretty effing sad, how every single thing on the school lunch tray is pre-packaged. So they don’t even fire up ovens anymore in school cafeterias? Just microwave everything in all this very wasteful individual packaging? And I’m appalled at the lunches themselves. Most of them don’t have a vegetable, subbing instead tater tots. Yeah, potato is a vegetable, but there ought to be something green or leafy or cruciferous too. What do vegetarian children do? Are there vegetarian lunch options? And why can’t school systems use more nutritious versions of foods at least, like whole wheat bread instead of white? Or offer sweet potato fries instead of tater tots once in a while? No, they really don’t fire up ovens in school cafeterias (at least not in NYC) because they can’t, really. At the risk of looking like a shill for the Times, there’s a really good article here about how school lunches work. [L]ittle actual cooking goes on in the nation’s largest public school system, largely because little of it can. Barely half of New York’s 1,385 school kitchens have enough cooking and fire-suppression equipment so cooks can actually sauté, brown or boil over open flame. Ovens that can’t be used or don’t exist + cafeteria workers who wouldn’t know how to use them anyway = processed, microwaved food. And this is beside the fact that kids have 20 minutes to get in line, pay, find their friends, sit down, eat, maybe talk a little, then bus their trays and get back to class. Twenty minutes. It’s really no wonder we’re a nation of scarfers and gorgers; 12 years of school lunch times will do that.